These entries are standard for using R code from other packages in a package. 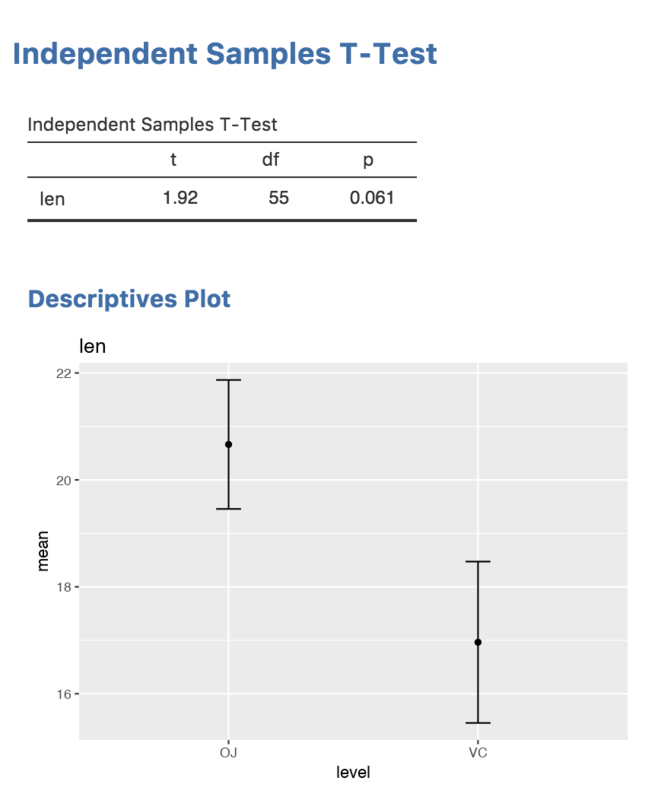 More information is available in Writing R Extensions. Now we have ggplot2 ready, we can proceed with using it in our analysis. In jamovi modules, plotting occurs in two stages; first the data for the plot is prepared, then the plot is rendered. The two stages mean that if the image is resized, or the user requests a different file format, only the rendering needs to be performed again — the data preparation needs only to occur once. The plot function accepts an argument image, which corresponds to the image object we called setState() on. We can retrieve the state object from this image with image$state, which we can see is being assigned to plotData. Following this are a number of calls to ggplot2 functions. A full discussion of how to use ggplot2 is well and truly beyond the scope of this document, but there are many excellent resources available online. Next we explicitly print the ggplot object. When using ggplot interactively in an R session, calling ggplot() leads to the creation of the plot, however, when calling ggplot from inside a function, it is necessary to explicitly call print(). The final statement is TRUE which is the return value. Don’t forget this! Returning true notifies the rendering system that you have plotted something. If you don’t return true, your plot will not appear. There are situations where the user may not have specified enough information for plotting, in which case the function should return FALSE.